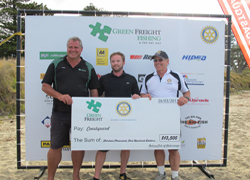 Pakuranga Rotary has, for 21 years, run a Charity Fishing Competition with the major proceeds going to Coastguard. Named the “Catch a Top Day Out” it is held around March each year. 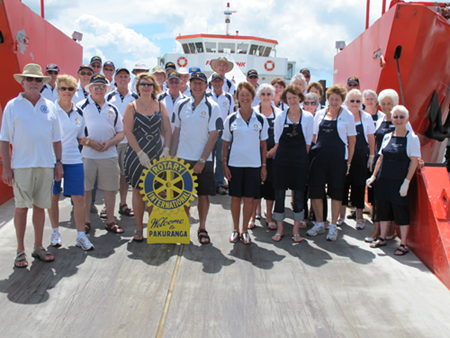 Pakuranga Rotary arranges for groups of corporate guests to go out on a launch fishing competition in the inner Hauraki Gulf. Each boat is supplied with fish bait, lunch and refreshments, with the day finishing in the evening with a meal on Motuihe Island and prize giving. We are always looking for more launch owners who would be interested in making their boat available for this fun and memorable fundraising event. If you have a launch and would be keen to help both Pakuranga Rotary and Coastguard, please get in touch with us on the contact us page. The role of Coastguard SAR personnel is preservation of life. This also means preservation of own lives first. If we are injured or incapacitated then we have greatly reduced the effectiveness of the team and possibly jeopardised the operation itself. There are three states for Auckland Coastguard vessels. Alongside crew available 24/7 to be called out by pager. Duty boat crewed available for tasking by the Operations Centre. Crewed but not a 'duty boat' available to be tasked. If a vessel is not available because it is 'dry docked' or allocated for work outside of Coastguard it is classified as 'Stood Down". The vessel can also be termed as dry docked which should be self explanatory and expected as all of our vessels are in a high state of maintenance and constant survey to meet regulations. The problems Auckland Coastguard rescue vessels deal with are endless in variety. There are the serious incidents like fire at sea or persons in the water or heart attack or sinking or overdue etc. Less serious incidents (but could become serious) like, run out of fuel, flat battery, blown motor, stuck anchor, dismasted, seasickness, first aid, jellyfish stings, sick animal, lost animal, aground, drifting ashore, lost dinghy, found dinghy, weather bound and so on. There are also the official requests like medical transfer from Waiheke for St Johns (which Coastguard has been involved with since the late 1930's). A duty day can be an endless string of 'incidents' comprised of a combination of one or more of the above or something not listed or in the winter months absolutely nothing at all [training time].The crews will be using radar, their eyeballs, their instincts, firepumps, first aid kits, towing equipment, battery jump start packs and leads, winches, dinghies, ropes, fenders, respirators, defibrulators, oxygen, blankets, stretchers, spints, toolkits etc etc. In the Control Room at the Marine Rescue Centre, a Duty Officer and Radio Operators with the oversight of a SAR Coordinator are receiving information, assessing need and making decisions on issues that need a Coastguard response 24/365. Linked to all agencies and departments, Police, Fire, NZRCC, St Johns, Harbour Master and many more the Control Room has the big picture so the rescue vessels can get on with the job Many Coastguard operations are precautionary, and as such they are not categorised as SAR. These operations provide ‘Good Samaritan Assistance’. An example would be going to the assistance of a vessel that is not in any distress (imminent danger) e.g. broken down and anchored in fair weather. Precautionary operations are not distress situations, and National SAR Authorities do not become involved. These situations however can and do sometimes deteriorate and turn into SAR operation, and the coordinating authorities will be informed immediately if there is cause for concern. Pakuranga Rotary is proud of its involvement with, as can be seen above, these vital and wide-ranging Coastguard services.